Sitting under the shadow of Volcan Villarrica (one of South America’s most active volcanoes) and on the shore of one of many lakes in the area, Pucón is a relatively small town in Chile that packs a massive punch. This gorgeous spot is known as the adventure capital of Chile and offers the perfect combination of adrenaline and nature. If you’re not careful, you might just blink and find an action-packed week has passed you by! An easy bus ride from Pucon, Huerquehue National Park offers a variety of trails for nature-lovers and based on the photos we’ve seen, is equally gorgeous, whatever the season. Entrance to the park is 2,500 pesos for tourists and the walk to the first lake inside the park is approximately 7km. The day we visited, the tracks were overtaken with snow making it a fairly challenging hike but in the summer it would be a walk in the park (sorry, that pun was too good to pass up)! Though some of our new friends gave us a ride in (thanks Lyle and Jackie! ), buses are available from town – just chat with Chili Kiwi and they’ll send you on your way. We’d already been told about the high quality of riding available in the region so when we arrived, this was one of the first things I checked out. With beautifully cared for horses and an instructor that’s spent all of her life around these beauties, it was an easy decision to ride with Corina… and seriously, with views out over four volcanoes, you’d be hard pressed to find a better spot! Whatever you call it – riverboarding, white-water sledging, river surfing or hydrospeeding – it’s about as much fun as you’ll ever have in the water! Without a doubt, it’s the best value extreme sport we’ve ever done. The river is clear, the staff professional, the scenery gorgeous and the price is beyond good. Adrenaline junkies, make sure it’s top of your Pucón must-do list! It’s not every day you get to snowboard or ski on an active volcano but in Pucón, not only is it possible but it’s relatively affordable. Lift passes will set you back 28,000 pesos each and by the time you arrange gear and transfers, you’ll be looking at around another 25,000 pesos. The mountain itself has a few different runs and jumps but is really best suited to beginner to intermediate boarders. One of the surprise highlights of our visit to Pucón, was Termas Geometricas. These stunning hot pools are dotted along a canyon and as natural stream rushes past, geothermal hot water keeps each of the 17 pools at their own constant temperature. With the snow falling and steam rising all around you, you’d be hard pressed to find a more impressive place to relax and soak away your worries. And yes, we have been to the Blue Lagoon in Iceland. Believe it or not, this was much more impressive! When you’re perfectly situated on the shores of a crystal-clear lake, even the chilly winter water can’t deter you from getting out there! Our accommodation, Chili Kiwi, offers guests the use of their stand up paddle board and kayaks and with the volcano in the background and sun on your back, it’s a pretty magical way to spend an afternoon. Guests can take them out to the nearby beaches or do as we did and enjoy just zipping around the lake. In addition to all of these activities, there’s also a volcano to climb (it’s actually one of the main reasons people come to Pucón – on a good day, visitors will even see lava bubbling away in the crater) waterfalls to explore (Chili Kiwi will provide you with a treasure map – it’s well worth the hike), rafting, biking and more. With all of the activities on offer though, you’ll definitely want a comfortable place to rest your head and prepare for the next days activities. As luck would have it, Pucón is also home to the winner of the coveted ‘best hostel in Latin America‘ award and speaking from experience, it’s the only place in town we’d want to stay. Where to Stay: Chili Kiwi – The friendliest hostel around! Arriving into town we’d heard of the Chili Kiwi and knew we wanted to check it out. After all, it’s not often you have the chance to stay in a hostel partially run by a fellow Kiwi in Chile! What we didn’t realise was that our planned three-night stay in Pucón would turn into almost two and a half weeks of fun at the most friendly, social hostel around, resulting in what I imagine will be life-long friends. There’s something special about this place. It’s the kind of place you walk into to find someone baking cookies (true story!) and where everyone happily chats away to one another There you’ll find a view would rival any top hotel and staff happy to share their insider knowledge about the town they love so much. When we arrived, James, one of the owners, sat us down and took us personally through all of the activities in the region and his suggestions for the best restaurants, groceries and shops – as they do with everyone. When a package didn’t arrive for us, Peter, the other owner, drove me into town and spoke with the courier company to help ensure my gear would make it safely to me. When Nathan needed a haircut, Jean wrote down word for word (in Spanish of course) a description of the style he wanted. For all of the funky rooms, toasty fireplaces and activities on offer, this is a place where they care about people to their very core. A backpackers run by backpackers, for backpackers. And maybe just the place for someone who’s never stayed in a hostel to give it a shot – I warn you though, it might just ruin you for life. Pro tip – if your budget will extend to it, we highly recommend booking the hobbit holes – they’re private, warm and have incredibly comfy beds. Your transport into Pucon will of course depend on where you’re coming from, but Chile being Chile, chances are you’ll arrive on a bus, like we did. We purchased our tickets online for Pullman Bus through Recorrido and after visiting a copy shop in Santiago (to print a copy of our booking), we exchanged our paperwork for our actual ticket just before boarding at the terminal. Santiago has two main stations, Terminal Borja and Terminal Sur; we opted for the second to allow ourselves a little more time in Valparaíso but either is fine. Pucon is an easy town to walk around in but should you need to get a lift, you have a few choices. Collectivos run relatively loose routes and can be flagged down at any stage (or hailed at set points in town). For a flat rate of only 500 pesos each, they’ll drop you where you want to go, picking up and dropping others off along the way. It’s an incredibly affordable means of transport and as the town’s quite small, a fast way to get around too. For activities outside of town, tourist shuttles can be arranged through accommodation providers and booking agents. These shuttles are fairly comfortable and will collect you either from your accommodation or a pre-designated location in town. If you’re wanting to go further afield, bus stations are spread throughout the town (each company has their own office) and tickets can be purchased both online and in person. The buses are comfortable and reliable, making both onward travel and local exploration a straightforward process. Is Pucón Worth a Visit? In case you hadn’t figured it out already, absolutely – yes! The town itself is drop-dead gorgeous whilst avoiding any sense of pretension. It offers a range of activities to suit everyone, often at prices far superior to other adventure-capitals and plenty of restaurants in town to keep foodies happy. For us though, the highlight of Pucón really was the people we met and that was made possible through our stay at Chili Kiwi. It’s the one place in town where you’re practically guaranteed to make great friends and that’s worth a whole lot in our books! Love the sound of Pucón as much as we did? Pin this post so someone else can discover this gem too! Thank you to Chili Kiwi for so kindly welcoming us to stay with them. As always, all thoughts are our own. We miss you already! This entry was posted in Accommodation, Activities, Adventure, Budget, Chile, Eco Tourism, Pucon, South America. Bookmark the permalink. I have been looking at Chile recently but I have actually never heard of Pucon so thanks for sharing! It looks like a great and fun town. I especially like the sound of those Termas Geometricas pools. The Chili Kiwi hostel sounds like a great place to stay. Sign me up for horseback riding and kayaking. 😀 Never done horse riding but would love to try out. Oh my God!! That hotel looks great!! Like a hobbit little house. I heard so many things about Chile, I am dying to visit! I’ve never even heard of this town, but now it’s definitely on my list! You know it’s pretty great when the volcano hike with lava is something of an afterthought. Those hot springs sound amazing. Do you think it’s better to visit in the summer or winter? I’m a BIG fan of thermal pools – but I’ve never experienced hot springs in the snow! That sounds like a total must – and a perfect match with staying in a hobbit hole, haha! Seriously, Pucon looks like it’s got something for everyone and such a variety of activities I’m not surprised you ended up staying for so much longer than you’d planned! Pucon is just the kind of place I need. The ultimate destination on the edge of the world with all one can ask for! I have a feeling that every season can offer different delights in this region but I do like the snow clad landscapes. I also loved the first image, the aerial view. The hydrospeeding looks and sounds pretty awesome! That’s a new one I haven’t seen before and I’d love to give it a try, even though I hate wiggling and squeezing myself in to dry suits. The hot springs also look amazing, and I agree that the Blue Lagoon isn’t all that. I much prefer Iceland’s natural hot pots and this one in Chile looks right up my alley! Your post has beautiful pictures and videos.Those snow clad mountains are breathtaking. 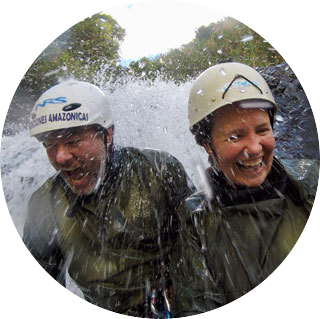 Hydro speeding looks like fun and hiking to the Huerquehue National Park will be thrilling. Your accommodation too is great. Will love to visit this place some day for sure.